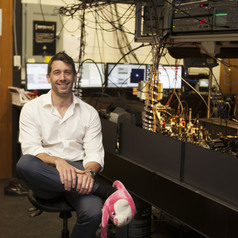 Prof. Michael J. Biercuk is an experimental physicist and Director of the Quantum Control Laboratory. Michael was educated in the United States, earning his undergraduate degree from the University of Pennsylvania, and his Master’s and Doctorate degrees from Harvard University. From 2005-2008 Michael served as a full-time scientific consultant to DARPA, where he specialized in quantum information science and next-generation microprocessor architectures. Following his time in DC, Michael returned to the laboratory working in the Ion Storage Group at NIST, Boulder. Michael is a regular contributor to both the technical literature and the popular press, providing commentary on issues pertaining to science policy and the role of science in society.